﻿ Norwela - Herbal Formulations, Supplements, Ayurvedic Products & Natural Remedies. Kidney stones are small, hard mineral deposits that form inside your kidneys. The stones are made of mineral and acid salts. Kidney stones have many causes and can affect any part of your urinary tract — from your kidneys to your bladder. Often, stones form when the urine becomes concentrated, allowing minerals to crystallize and stick together.Passing kidney stones can be quite painful, but the stones usually cause no permanent damage. A kidney stone may not cause symptoms until it moves around within your kidney or passes into your ureter. At that point, you may experience these signs and symptoms:Severe pain in the side and back, below the ribs, Pain that spreads to the lower abdomen and groin, Pain that comes in waves and fluctuates in intensity, Pain on urination, Pink, red or brown urine, Cloudy or foul-smelling urine, Nausea and vomiting, Persistent need to urinate, Urinating more often than usual, Fever and chills if an infection is present, Urinating small amounts of urine. 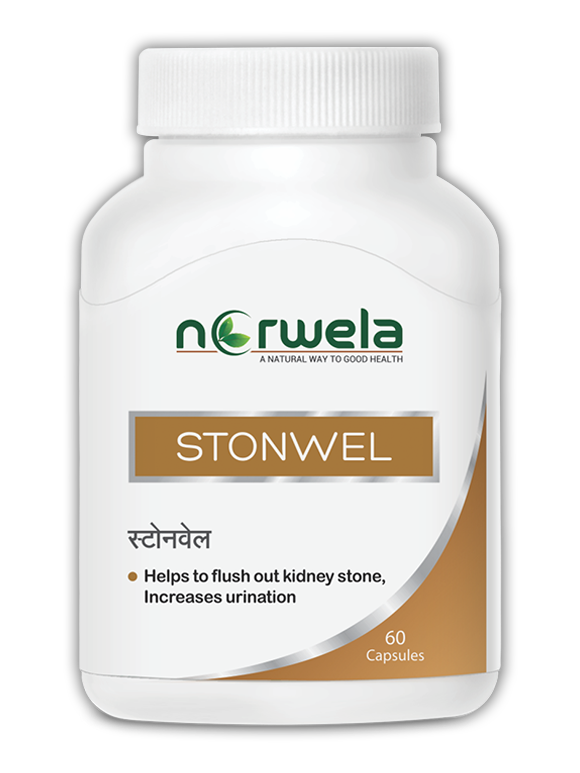 Norwela Offers 100% effective ayurvedic medicine for kidney Stone called Stonwel. Stonwel contains combination of standardized extracts of various herbs that have proven quality of healing of Kidney Stone. The synergistic effect of multiple herbs involved in this formulation promotes complete removal of stone from kidney, urinary tract and urinary bladder. Through trials, our Stonwelhas been found to be highly effective to disintegrates kidney stone by dissolving binding agents, increases urination to flush the stone out, relieves pain and painful urination, prevents urinary tract infections and recurrence of kidney stone.